– Du må bite tenna sammen. Sylvi Listhaug in the evening "Lindmo" TV program. "If we had an Olympic championship about it, I would have won a prize - Being at the centre of political trouble has almost become a way of life," says former Justice Minister Sylvi Listhaug (Frp). In the evening, "Lindmo", she says that when you are a politician you must be mistaken. "I have the philosophy that I can not do anything about what has happened. I do not spend time with that, says Sylvi Listhaug when interviewed, Anne Lindmo asks her to look back in time around the Facebook posting, which led to her resignation as Justice Minister. "So you have not used any thinking power to process the sky-pump you were in for twelve days?" No, because then I finished it. You have to grit your teeth together. Listhaug resigned as Minister of Justice on March 20th. She lost the trust of the majority after she released a Facebook status claiming that "AP believes the rights of terrorists are more important than the nation's security." Listhaug says she did not think she could have done anything differently. "I said I'm sorry, and then I go on," she said. Lindmo says she has watched the recording from the Storting where Listhaug had to go to the chair again and again and apologize. No, I felt I had tried to regret it. You have to grit your teeth together and stand firm. If we had had an Olympic championship in a hurry, I would have benefited from it, answered Listhaug and laughs. She says she has been through so many storms that it has almost become a lifestyle. Is it great to really always know that you are right? I say what I mean. I've always been like that. When I was young, I was not concerned with what others were saying about me. It's delicious because otherwise, it will be so tiring, as a politician, you're disliked by someone anyway. 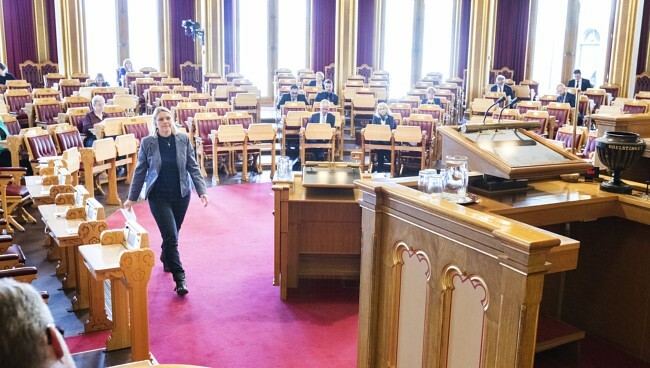 Sylvi Listhaug had to go to the parliament's chair and apologize several times. Listhaug says, among other things, she has thought about how much she has been working in recent years and sees that it would be even more than the children if she was still at the same pace. "When I started as a Government Minister, the smallest one was in a diaper, now he is seven and at first grade," she says. Listhaug describes the years as a Minister like being in a tunnel where everything just rages off. "I do not think you understand how it is until you´ve been there, how fast it goes and how much it takes to get involved and participate. And four and a half years of a state of emergency with firstly two children, pregnancy and a new childbirth, having to take a break from the job. It's was crazy, but I've come through it. Disclaimer: The contents of this article are of sole responsibility of the author(s). Human-Synthesis will not be responsible for any inaccurate or incorrect statement in this article. Human-Synthesis grants permission to cross-post original Human-Synthesis articles on community internet sites as long as the text & title are not modified. The source and the author's copyright must be displayed. For publication of Human-Synthesis articles in print or other forms including commercial internet sites. Human-Synthesis contains copyrighted material the use of which has not always been specifically authorized by the copyright owner. We are making such material available to our readers under the provisions of "fair use" in an effort to advance a better understanding of political, economic and social issues. The material on this site is distributed without profit to those who have expressed a prior interest in receiving it for research and educational purposes. If you wish to use copyrighted material for purposes other than "fair use" you must request permission from the copyright owner.